Second-half goals from the Power brothers Richie and John helped Kilkenny beat Tipperary 2-17 to 2-14 in the All-Ireland Hurling Final replay. Seamus Callanan's 28th-minute goal enabled Tipp to lead 1-7 to 0-8 at the break after a tight first half. However, Kilkenny moved ahead after the restart and Richie Power's crucial goal on 59 minutes left them four ahead. John Power's goal increased the lead to six and while Callanan's second goal gave Tipp hope, the Cats held on. The victory gave Kilkenny their 35th title and substitute Henry Shefflin became the first man to win a 10th All-Ireland senior hurling medal. Both defences were outstanding in the relatively low-scoring replay and Brian Cody's decision to recall Kieran Joyce was totally vindicated as he went on to produce a brilliant centre half-back display. Points from Shane McGrath and Noel McGrath gave Tipp an early two-point lead before Richie Hogan's score started a reply of four unanswered points from the Cats. Tipp fought back to level at 0-4 to 0-4 and they moved ahead in the 28th minute as Callanan fired to the net from close range after being set up by Lar Corbett. The goal helped Tipp lead by two at the interval but Kilkenny responded after the break with five straight points including efforts from Richie Power at TJ Reid. Tipperary keeper Darren Gleeson made a brilliant save to deny a Colin Fennelly goal while Tipp then spurned a goal chance at the other end as Callanan was content to point a penalty after Patrick Maher had tumbled in the Kilkenny square. Shortly after Shefflin's arrival, Kilkenny moved four ahead in the 59th minute as Richie Power fielded a long ball and drilled past Gleeson. Within four minutes the second Power brother had struck a second Cats goal after a goalmouth scramble. To their credit, Tipp kept battling and Callanan blasted in his second goal a minute from the end of normal time to leave only two between the teams. That set up a frantic finish and while Colin Fennelly's injury-time point extended Kilkenny's lead to three, they endured a few more nervous moment before their celebrations could begin. 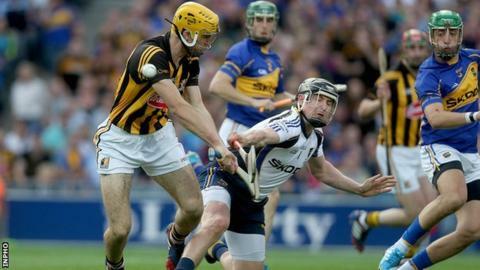 Kilkenny: E Murphy; K Joyce, JJ Delaney, P Walsh (0-1); P Murphy, JJ Delaney, C Buckley; M Fennelly (0-2), C Fogarty; C Fennelly (0-3), R Hogan (0-2), E Larkin (0-2); R Power (1-1), TJ Reid (0-5), J Power (1-1). Subs: H Shefflin for Hogan, L Ryan for M Fennelly. Tipperary: D Gleeson; C Barrett, J Barry, P Stapleton; B Maher (0-1), Padraic Maher, K Bergin; S McGrath (0-3), J Woodlock; G Ryan, J O'Dwyer (0-3), L Corbett; N McGrath (0-2), S Callanan (2-5), Patrick Maher. Subs: M Cahill for S McGrath, C O'Mahony for Ryan, S Bourke for Corbett, J Forde for N McGrath, J O'Brien for O'Dwyer.